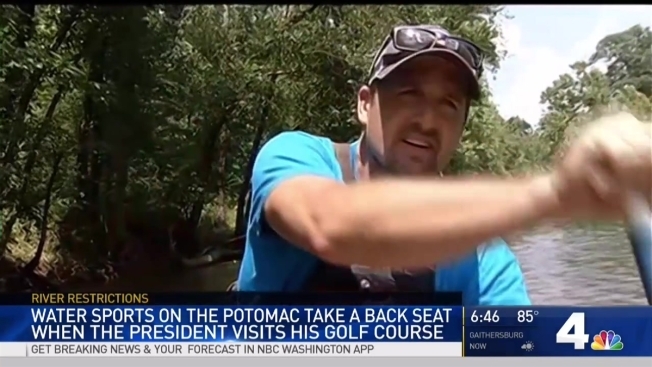 If President Donald Trump is at his golf courses in Virginia, don't expect to be able to paddle down the Potomac River nearby. A new rule issued by the United States Coast Guard allows a section of the river spanning more than 2 miles to be closed before, after and during events held at Trump National Golf Club in Potomac Falls, Virginia. Hundreds of people use the river every day, including kayakers, summer campers, those with nonprofit groups and those with small businesses that rent gear. Susan Sherrod, the chairwoman of the Canoe Cruisers Association, said she was outraged by the new rule. "It just seems blatantly unfair that Trump shuts everything down so he can have a nice day playing golf, and the rest of us are just out of luck," she said. Matt Markoff of the outdoor adventure nonprofit Calleva Outdoors, was worried about the logistical impacts. "One of my main concerns is having a group that's on the other side of the security zone, and the end of the day comes and it's time for them to come back and get on buses and go home, and they can't pass through the security zone and I can't get them around," he said. According to the Coast Guard, officials already have set up temporary security zones around the club five times since March, at the request of the Secret Service. Boaters said those security zones were smaller and did not require boaters to leave the water. Adam Van Grack, an attorney for USA Canoe/Kayak, said the president's security is key, but the new rule goes too far. "We're talking about a multiple-mile stretch of river, from bank to bank, and essentially not giving any limits to their rights to do it," he said. Many people who use the river are hoping a compromise can be reached. The Coast Guard is accepting public comment on the rule through August 9.